As for the final itself, well, after a tough and determined Germany Uruguay third-place play off on Saturday, Spain Holland was a pretty underwhelming affair, but it could have gone either way. It took until extra time for Andres Iniesta to insert the winning goal, in the same instance that British ref Howard Webb earned the ire of the Dutch – probably forever more, as these things work out – for not awarding a corner that might have made all the difference. Webb looked stern and non-negotiable throughout. He had a tough gig, doling out 14 yellow cards and sending off Johnny Heitinga at the 109 minute mark. I have been enjoying watching Iniesta running around like the clappers, and I understand the t-shirt slogan under his shirt, the showing of which earned him one of those 14 yellow cards, was a tribute to Dani Jarque a 26-year old Sevilla player and teammate who’d died suddenly from a heart attack. You had to love him for that. *When I’ll next be watching football. 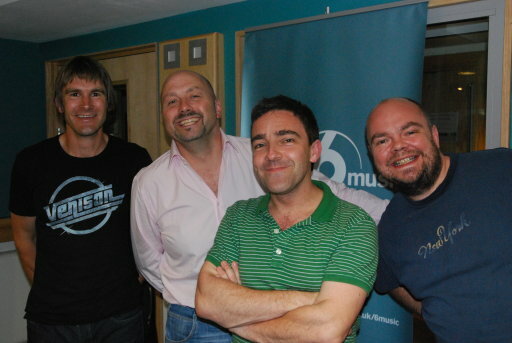 I found myself in conversation about the World Cup with three proper football fans yesterday, courtesy of 6 Music, where I’ve been filling in on Steve Lamacq’s show all week. They’d set up a World Cup Roundtable, which didn’t mean we only reviewed records with Terry Venables or James Corden on them, but all three guests knew their football and their music (not a large squad to pick from). Damien Harris I’ve met on many occasions – Midfield General, founder of the mighty Skint records, sponsor for ten years of Brighton football club – but it was quite a change to have across the desk from me Mark Clemmit, of 5 Live and BBC1’s Football League Show, and Matt Lawrence, former Millwall and Crystal Palace defender, currently “between teams”. (Aged 36, he’s such a 6 Music kind of guy he was down on the new Laura Marling/Mumford & Sons single because he preferred Marling’s stripped-down original recording. And he knows more than me about The Gaslight Anthem’s first album.) I can gas about the World Cup with friends and family, who know my history, but here I was with a BBC football reporter and a professional league footballer. Would could possibly go wrong? This wasn’t set up as a test, but it was one. Although we were talking mostly music on-air, talk was frequently of football off-air, and I think I held my own fairly well about the World Cup. I’m glad that the question of who I support didn’t come up, as my admission that I don’t have “a team” would have soured the mood. As it was, we chatted merrily about Gareth Southgate’s jumper and Robbie Earlie’s freebies and how disappointing so many of the big star players have been. I don’t watch the World Cup in order that I may conduct myself in a certain way in social situations – I watch it because I love it – but this was one, and I felt comfortable. I didn’t feel like a fraud, or the Jon Thompson “soccer” fan on The Fast Show. Despite an early goal from van Bronckhorst (who insulting people have said I look like) and a starburst of big player magic from an equalising Forlan at 25 yards just before half-time, Holland Uruguay was not an exhibition match in the first half, with both sides struggling to break through the other’s defence. But two orange goals within three minutes in the second half by Wesley Sneijder – now the tournament’s joint top goal scorer with Villa – and Arjen Robben, turned all the lights on. Even though that all-European final seemed safely in the bag at this point, Uruguay – lacking red-carded volleyball player Suarez – refused to give up, scoring their second goal in the second minute of extra time. This was a gripping, fizzing, entertaining end to a match that ended up being a high-ish scorer. I realise Uruguay were the team to support, as they’re the underdogs, but apart from Forlan in his pomp, they’re a pretty ugly team to watch (and I don’t mean their faces), and they didn’t deserve to beat Ghana anyway. Holland haven’t been the second best team in the tournament, but that’s not the way football works, is it? They haven’t played in a World Cup final since the 70s, so let’s hope they are up the job on Sunday in Johannesburg. After beating Germany in Durban – as predicted by Paul the Oberhausen octopus – Spain are in the World Cup final for the first time. They’ve won all their games since that early upset with Switzerland (which now seems so long ago) and may well be the competition’s quiet victors (Holland have won all theirs), despite suffering from the same blight as Italy, France, Brazil and England: star player not playing like a star. Torres didn’t even start against Germany, and when he came on he might as well not have, muffing his first pass and looking a bit slow. No wonder Villa didn’t even see him. Perhaps he didn’t actually realise he was on the pitch. What struck me most was how tall the Germans were compared to the Spaniards. It was like the game had been tampered with using Lord Of The Rings-style CGI. Spain really were the giant killers. A fabulous weekend awaits. And what kind of a name for an octopus is Paul? Oh, and here’s that Roundtable World Cup lineup: (from left) Matt Lawrence, Mark Clemmit, Andrew Collins, Damien Harris – they thought it was all over!